For jewel bugs, see Scutelleridae. Buprestidae is a family of beetles known as jewel beetles or metallic wood-boring beetles because of their glossy iridescent colors. Larvae of this family are known as flatheaded borers. The family is among the largest of the beetles, with some 15,500 species known in 775 genera. In addition, almost 100 fossil species have been described. The larger and more spectacularly colored jewel beetles are highly prized by insect collectors. The elytra of some Buprestidae species have been traditionally used in beetlewing jewellery and decoration in certain countries in Asia, like India, Thailand and Japan. Shape is generally cylindrical or elongate to ovoid, with lengths ranging from 3 to 80 mm (0.12 to 3.15 in), although most species are under 20 mm (0.79 in). Catoxantha, Chrysaspis, Euchroma and Megaloxantha contain the largest species. A variety of bright colors are known, often in complicated patterns. 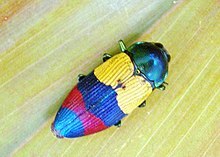 The iridescence common to these beetles is not due to pigments in the exoskeleton, but instead is caused by structural coloration, in which microscopic texture in their cuticle selectively reflects specific frequencies of light in particular directions. This is the same effect that makes a compact disc reflect multiple colors. The larvae bore through roots, logs, stems, and leaves of various types of plants, ranging from trees to grasses. The wood boring types generally favor dying or dead branches on otherwise-healthy trees, while a few types attack green wood; some of these are serious pests capable of killing trees and causing major economic damage, such as the invasive emerald ash borer. Some species are attracted to recently burned forests to lay their eggs. They can sense pine wood smoke from up to 50 miles away, and can see infrared light, helping them to zero in as they get closer to a forest fire. Ten species of flatheaded borers of the family Buprestidae feed on spruce and fir, but hemlock is their preferred food source (Rose and Lindquist 1985). As with roundheaded borers, most feeding occurs in dying or dead trees, or close to injuries on living trees. Damage becomes abundant only where a continuing supply of breeding material is available. The life history of these borers is similar to that of the roundheaded borers, but some exceedingly long life cycles have been reported under adverse conditions. Full-grown larvae, up to 25 mm long, are characteristically flattened, the anterior part of the body being much broader than the rest. The bronzed adults are usually seen only where suitable material occurs in sunny locations. Jewel beetle classification is not yet robustly established, although there appear to be five or six main lineages, which may be considered subfamilies, possibly with one or two being raised to families in their own right. Some other systems define up to 14 subfamilies. ^ "The first fossil buprestids from the Middle Jurassic Jiulongshan Formation of China (Coleoptera: Buprestidae)" (PDF). Zootaxa. 2745: 53–62. 2011. ^ H. Schmitz, H. Bleckmann (1998). "The photomechanic infrared receptor for the detection of forest fires in the beetle Melanophila acuminata (Coleoptera: Buprestidae)". J Comp Physiol A. 182: 647–657. Bellamy, C.L. & Nelson, G.H. (2002): Buprestidae. In: Arnett, Ross H. Jr. & Thomas, Michael C.: American Beetles (Volume 2). CRC Press. Akiyama, K. and S. Ohmomo. 2000. 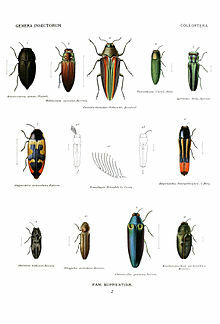 The Buprestid Beetles of the World. Iconographic Series of Insects 4. ISBN 4-943955-04-5. A 341-page work with 120 colour plates. Wikimedia Commons has media related to Afrophorella.